The main objective of the lecture is to show broad application of the thermodynamic theory of elasto-viscoplasicity for the description of important problems in modern manufacturing processes, and particularly for meso-, micro-, and nano-mechanical issues. This description is particularly needed for the investigation by using the numerical methods how to avoid unexpected plastic strain localization and localized fracture phenomena in new manufacturing technology. In the first part the development of thermo-elasto-viscoplastic constitutive model of a material which takes into consideration the induced anisotropy effects as well as observed contribution to strain rate effects generated by microshear banding is presented. The model is developed within the thermodynamic framework of a unique, covariance constitutive structure with a finite set of the internal state variables. A set of internal state variables consists of one scalar and two tensors, namely the equivalent inelastic deformation ∈ p , the second order microdamage tensor ξ with the physical interpretation that (ξ : ξ)1/2 = ξ defines the volume fraction porosity and the residual stress tensor (the back stress) α. The equivalent inelastic deformation ∈ p describes the dissipation effects generated by viscoplastic flow phenomena, the microdamage tensor ξ takes into account the anisotropic intrinsic microdamage mechanisms on internal dissipation and the back stress tensor α aims at the description of dissipation effects caused by the second kind of induce anisotropy approximated by the kinematic hardening mechanism. To describe the contribution to strain rate effects generated by microshear banding we propose to introduce certain scalar function which affects the relaxation time T m in the viscoplastic flow rule. The relaxation time is used as a regularization parameter. Fracture criterion based on the evolution of the anisotropic intrinsic microdamage is formulated. The fundamental features of the proposed constitutive theory have been carefully discussed. The objective of the second part is to discuss very efficient procedure of the numerical investigation of localized fracture in inelastic solids generated by impact-loaded adiabatic processes. 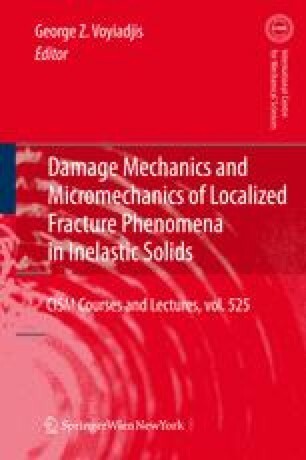 Particular attention is focused on the proper description of a ductile mode of fracture propagating along the shear band for high impact velocities. This procedure of investigation is based on utilization the finite difference and finite element methods for regularized thermo-elastoviscoplastic model of damaged material. Numerical investigation of localized fracture phenomena in inelastic solids generated by impact-loaded adiabatic processes. The physical and experimental motivation for each problem have been presented. The identification procedure for the material functions and constants involved in the constitutive equations is developed basing on the experimental observations. Qualitative comparison of numerical results with experimental observation data has been presented. The numerical results obtained have proven the usefulness of the thermo-elasto-viscoplastic theory in the investigation of dynamic shear band propagations and localized fracture.